to seeing his child, whom he loves so dearly, come home. The above picture comes from the Museum of Fine Arts in Boston, USA. Drawn by an unidentified French artist in the nineteenth century it is by no means the best representation of Priam’s supplication to Achilles. I chose it, though, because unlike other images, it shows Hector’s body still tied to the cart that Achilles rode round Troy after killing his enemy, which brings to mind Alexander’s punishment of Betis after the siege of Gaza. Betis was brought before the young king, who was elated with haughty satisfaction, although he generally admired courage even in an enemy. ‘You shall not have the death you wanted,’ he said. ‘Instead, you can expect to suffer whatever torment can be devised against a prisoner.’ Betis gave Alexander a look that was not just fearless, but downright defiant, and uttered not a word in reply to his threats. ‘Do you see his obstinate silence?’ said Alexander. ‘Has he knelt to me? Has he uttered one word of entreaty? But I shall overcome his silence: at the very least I shall punctuate it with groans.’ Alexander’s anger turned to fury, his recent successes already suggesting to his mind foreign modes of behaviour. 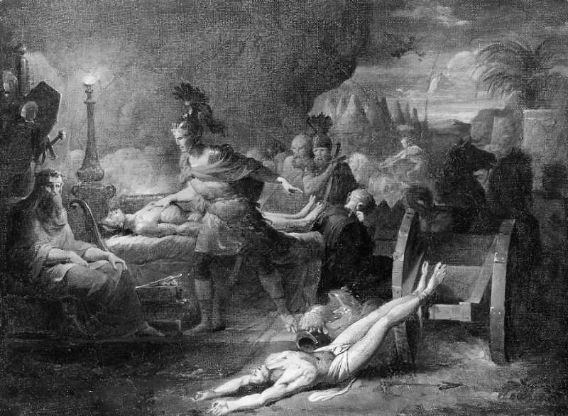 Thongs were passed through Betis’ ankles while he still breathed, and he was tied to a chariot. Then Alexander’s horses dragged him around the city while the king gloated at having followed the example of his ancestor Achilles in punishing his enemy. Achilles’ treatment of Hector’s body and Alexander of the still living Betis represent black moments in the men’s lives – the day when their desire for vengeance got the better of their reason and honour. The episodes end very differently. Achilles – albeit at the behest of the gods – eventually gives Hector’s body back to his father, Priam. Betis was duly executed and Alexander moved on to continue his conquest of the Persian empire. Except… in his notes to de Sélincourt’s translation of Arrian’s Campaigns of Alexander, J R Hamilton casts doubt on whether the incident actually happened. He does not, however, give a reason for this. This post is a day late. Apologies! The great actor Peter O’Toole, who died yesterday at the age of 81 played Priam in 2004 film Troy. Requiem Aeternam dona ei, Domine. Et lux perpetua luceat ei: Requiescat in pace. Amen.